IBPS RRB Officer Scale 1 Notification 2017 has released. Apply online for IBPS CWE VI Officer jobs before the last date, i.e, 14th August 2017. Here on this page, you may get details such as RRB Officers Vacancy, Eligibility, Application process, etc. of Regional Rural Bank Recruitment 2017. Hence, go through the following sections of this article and apply for IBPS RRB Group A Officers (Scale I, II, III) Vacancies. Latest Update: IBPS has released the RRB CWE VI Notification on 22/07/2017. So, don’t waste your time and apply for IBPS RRB Officer Exam before the last date. The much awaited IBPS RRB Officer Scale 1 Exam dates are out. We all know that the Institute of Banking Personnel Selection (IBPS) conducts recruitment drive for Probationary Officers/ Scale-I Officer posts once a year. So, the officials of IBPS has released its calendar for the year 2017. As per the latest news, the official notification for IBPS RRB CWE VI Recruitment 2017 will be out tentatively in the month of July 2017. The Regional Rural Banks (RRBs) are small-scale, local banks located in different Indian states. The main focus of these banks is to provide financial assistance at the grass root level. In order to fill the vacancies available in the 56 Regional Rural Banks, IBPS will conduct RRB Officers and Office Assistant Exam every year. But this page is about IBPS RRB Recruitment 2017 for the post of CWE VI Officers (Scale 1, 2, 3). As per their annual calendar, the officials will release the IBPS RRB Grade A Officer Notification in the month of July. However, a notification has gone viral on social media in the recent times that the authorities have released the notification. So, whenever the officials release the notification, we will update on this page. Hence keep visiting this page regularly. 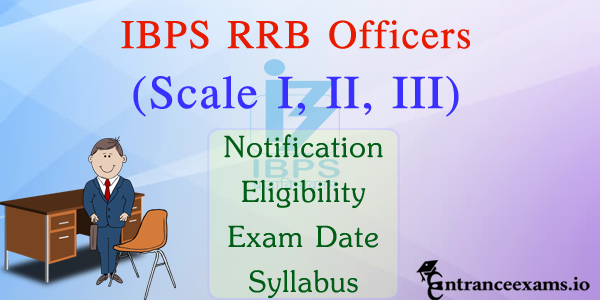 The job responsibilities of IBPS RRB Officers Scale 1, 2, and 3 is same. But the only difference is Scale 2 & 3 officers require experience in the relevant field. Also, the streams may vary for all these Scale I, II, III posts. The posts available under IBPS RRB Officer Scale 2 Exam are Agriculture Officer, Marketing Officer, Treasury Manager, Law Officer, Chartered Accountant, IT Officer, and General Banking Officer. But a candidate can apply for only one post in the officer cadre. So, know the Eligibility conditions of IBPS RRB CWE VI Officers and apply for the relevant post. Candidates should ensure that they fulfill the eligibility criteria of IBPS RRB Officer Scale 1 Notification 2017. If you found you are eligible for this IBPS RRB CWE VI PO Exam, then only fill the online application. If in case you are found ineligible, then the officials will cancel your candidature. Therefore, the postulants must ensure they fulfill the minimum eligibility criteria specified by the board. Applicants can check below for IBPS RRB PO VI Eligibility Criteria. An important part of the IBPS RRB Officers Eligibility Criteria is that you should know the language of the region where you get posted. So, refer the official website, i.e., www.ibps.in to know the desired local language of RRB. The age limit of the candidates applying for IBPS RRB Group A Officers (Scale I, II, III) post is given in the table below. The candidate’s age is calculated as on 01/07/2017. However, upper age limit is relaxable for reserved categories as per the norms of the organization. SC/ ST category: 5 years. For OBC Category: 3 years. Ex-servicemen: +3 years, subject to a maximum of 50 years. Persons with Disabilities: 10 years (GEN), 13 years (OBC), 15 years (SC/ST). For IBPS RRB CWE VI Officer Scale I post, a Bachelor’s degree in any discipline with knowledge of Computer and Proficiency in Local Language of RRB is required. Aspirants must have done a degree in any discipline with minimum 50% marks and five years work experience as an Officer in the bank to apply for IBPS RRB Officer Scale III posts. For IBPS RRB Officer Scale 2, postulants must have completed Bachelor’s degree or CA from ICAI or MBA in the relevant stream. Moreover, you must have working experience in the relevant field. If you are applying for Specialist Officer – IT post under CWE 6 RRB Officer Scale II, then a Certificate in ASP, PHP, C++, Java, VB, VC, OCP etc. is desirable. The officials will shortlist the candidates of IBPS CRP VI Officers Exam based on their performance in the following rounds. Hence, the candidates who complete all of these rounds will be allotted a bank based on the priority set while applying online. All the applied candidates should pay the application fee in online mode. General/ OBC category: Rs. 600/-. SC/ST/ PWD Candidates: Rs. 100/-. The IBPS RRB Officer Scale 1 Salary in hand is as follows. Scale I: Rs. 29,000 – 33,000. Scale II: Rs. 33,000 – 39,000. Scale III: Rs. 38,000 – 44,000. Visit the official website, i.e., www.ibps.in or direct link given below. There on the left side, click on CWE RRBs section. Navigate to CWE Regional Rural Banks Phase VI link. Now click the IBPS RRB Officers Scale I, II, III Apply online link. Complete the online registration process by following the given instructions. Login with those credentials and enter the further details. Upload scanned copies of required documents in the given format. Make fee payment in online mode before the due date. Verify all the details once before submitting the IBPS RRB PO Application form. Finally, take a print out of the form for future use. The very first thing every aspirant of IBPS RRB Officer Scale 1 exam is to refer the syllabus and pattern. Because it plays an important role in the preparation. From this page, you can get the complete IBPS RRB Officer Scale 1 Syllabus for both prelims and mains exam. So, by referring this, you may get an idea about the topics covered in the IBPS RRB CWE VI Officers (Scale 1, 2, 3) Exam. To get successful, candidates must have a knowledge on the outline of the exam. So, for your convenience, I have given the detailed IBPS RRB PO Exam Pattern. Knowing the test pattern of IBPS RRB Officer Scale 1 Exam beforehand will keep you a step ahead in the competition. Hence follow the test pattern of both Prelims and Mains exam and perform well in the exam. To know the exact Exam Pattern, time limit, number of questions, topics, etc. for the exam for each post, click the link below. Since IBPS RRB PO 2017 notification was out, you should start your preparation right now. Here we are providing you the online mock tests of IBPS RRB Grade A Officers exam for free of cost. So, with the help of this RRB Grade A Officers Mock Test, you can improve your skill set. Moreover, practicing Mock tests can also help you to prepare for other competitive exams. Since this IBPS RRB Officer Scale 1 Free Online Mock Test replicates the actual online test in the examination hall, I suggest you practice 10 to 12 mock tests before appearing the exam. Also, it provides you a chance to recognize your mistakes beforehand so that you can work on them. Hence by practicing this IBPS RRB Officer Scale 1 Mock Test, you can get a fair idea of your expected score, rank and chances of success in the IBPS online test. Each and every candidate who attended the IBPS RRB Officers Exam need to obtain a minimum score in both prelims and mains exam. The officials will shortlist the candidates for the Interview round based on the marks scored in each test of online mains exam. Qualifying in just individual tests is not sufficient; candidates should also score sufficiently high on the Total score in order of merit to be called for interviews /provisional allotment. Hence depending on the number of vacancies available, the adequate number of candidates in each category not exceeding three times of the declared vacancies in each state will be called for interview. To know more about the IBPS RRB Officer Scale 1 Cut Off 2017, click the below link. Here, you can also get category wise IBPS RRB VI PO Cutoff marks. After the IBPS RRB Officer Scale 1 exam was conducted, the officials will declare the results for both Prelims and Mains exam. Here we will provide the direct link for checking IBPS RRB Officer Scale 1, 2, 3 Results on this page. Hence, all the postulants can follow the below link and know How to check IBPS RRB CWE VI PO Results online. This is all about IBPS RRB Officer Scale 1, 2, 3 Notification. Hope after going through this article you may get an idea about What is IBPS RRB CWE VI Exam. If you have any doubts, you may ask us in the below comment section. Also, stay tuned with our www.entranceexams.io site for more details about all Entrance Exams, State Govt, and Central Government Jobs in India.